Matt Stevens remains an enigma in musical terms. His debut album “Ghosts” represented a welcome change in the crop of albums released at the time. I don’t think Matt would mind me saying that his music is prog on a very small scale and really is a contrast to the the big boys of the Prog class, who armed with their array of personnel and associated machinery are able to manufacture huge productions. Matt on the other hand paints from a smaller creating smaller scale musical sketches with the aid of his predominately acoustic guitar. 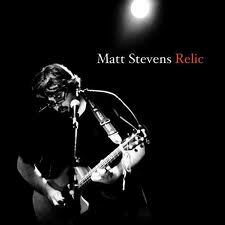 Matt’s second album Relic under scrutiny here continues in the same vein and has become an album which i have found captivating. Looking at the sparse yet neatly presented card jewel case all relevant data is brief and concise sighting assistance from Kevin Feazey ( bass, Programming & keyboards ) Chrissie Caulfield ( violin ) and Stuart Marshall 9 drums ). From the outset, the beat box metronomic pulse of “Nightbus” really gets things kicked off at a trot. The dry recording of Matt’s acoustic overl-ayered somehow give a 1960’s feel to what is obviously a contempory sound and sets the scene for an intriguing faray into an interesting take on matt’s guitar and gadget adventures. In a hare’s breath the title piece “Relic” is flaying itself at you in a very dramatic fashion leaving you in need of a towel to wipe the sweat from your brow. The raw energy of the music contained withing nearly all of the titles on the album really does prove that sometimes less is more. The soundstage of many pieces included on the album is compact yet brimming with an interesting acoustic balance. “Rusty” is a good example of this. Stuart Marhall’ drums sound slightly compressed yet maintain pace and grip hurling the chiming guitar t0 a high octain conclusion. “20 goto 10” contains some great programming, beat driven electric guitar and bass which again travels along at a reasonable speed and perfectly contrated by “Rushden Fair” with some excellent picking and strumming. If you are of a certain age you may well be reminded of better days when such guitar sounds could be found on TV in childrens programmes like Chigley and camberwick Green. “Up” returns swiftly to the upbeat and full sounding musical picture complete with hand claps and a great retro synth sound followed quickly by the excellent “Scapegoat” a piece yet again crammed with interesting sounds and rythmns. Most of the titles invoke an image throughout, though none more so thean the exquisite “Sand Part2”. having never heard”Sand 1″ was a little confused as there is no such title on the “Ghost” album. However, if there was ever a fitting theme tune for a spy movie this is the one. I could almost hear Michael Caine’s threatening overtones such was the atmosphere created by this intriguing piece which seems to take flight half way through with some interesting electronic noodlings. Sadly the following venture “frost” did just that. it left me feeling cold as Matt hit the grunge button big style which i fear left my delicate Prog ears in shreds. this i feel may well appeal to those who enjoy the metal leanings of modern Prog artiste’s. Redeeming himself beautifully though, Matt terminated this excellent album with “30 End” beginning as it does with a lilting guitar sound that reminds you of hank Marvin with a great Mellotron patch that moves it into Hackett territory. However, the rather noisy conclusion can play havoc with speaker cones so play wisely and perhaps even remove the cat or any other pets or frail human beings from the room until the final track fully terminates. Not the last word in production then? Though i found that despite it’s smaller scale benefited from being listened to with the volume turned up a tad. Failing the ability to do so i would advise listening via headphones as the album seems to have been made for a quality pair of sennheiser’s. As a whole i would describe the album as quirky, interesting, pleasantly different and a welcome addition to any prog lovers collection. Matt Stevens approach to composing diverse and interesting and rich harmonic tones is a joy and takes the listener off auto pilot. Listen with an open mind and enjoy. Available from www.mattstevensguitar.com as cd or flac files. Cost £9. allow five days for delivery.